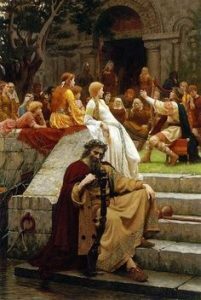 Below is the detailed biography of Edmund Blair Leighton, an English painter that specialized in the paintings of the medieval era and of the time of the reign of King George III. 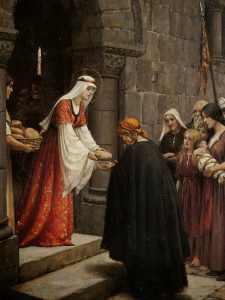 His historical paintings have been a basis of study in the Victorian Era. 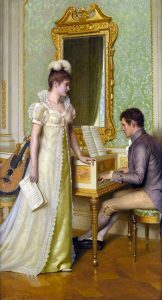 His romantic paintings have high detail and are all across England in various museums and private collections. 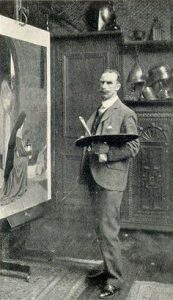 An image of Edmund Blair Leighton working at the Studio. 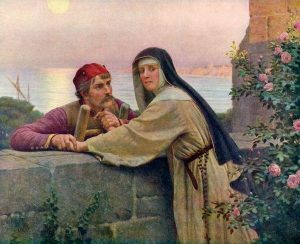 Edmund Blair Leighton was the son of Charles Blair Leighton, an English painter and his wife Caroline Leighton. He was born in London on the 21st of September 1852. 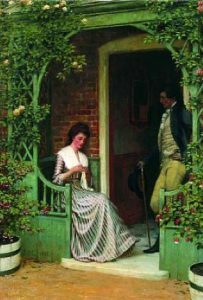 He was an alumnus of the University College School and because of his father’s influence and excellence in art, he joined the Royal Academy Schools. Blair’s father passed away when Blair was only 2 years old and his father, a young artist aged 32. 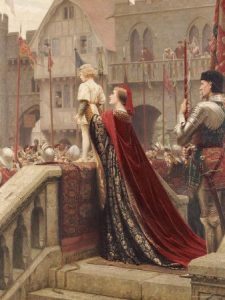 His flair for art was recognized immediately by his mother and other family members and therefore, he received huge support from his family in his learning of art. He also took an evening class in art at South Kensington. 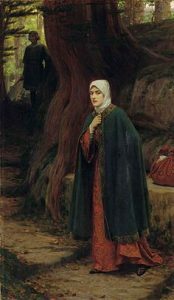 Henrietta Rae, the celebrated English painter was a colleague of him while he studied at the Royal Academy School of Art. 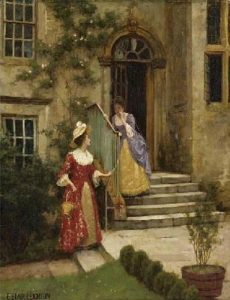 After receiving training of one and a half years at the Royal Academy Schools, he exhibited his first painting, ‘A Flaw in the Title’. It was a black and white painting that he made at his small studio and became highly popularised among critics as well as the public. 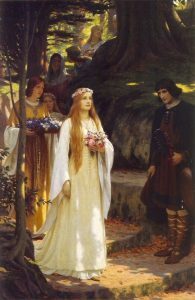 Blair’s romantic paintings are in museums all over Europe. 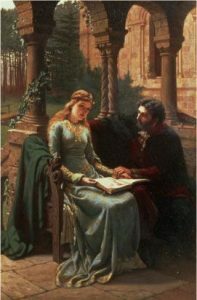 His use of color and high detailing in his romantic painting tell a complete story of the subjects in the painting by just one landscape or portrait. 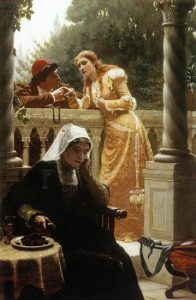 Although studied at the Royal Academy Schools, he was never a member or an associate of the Academy. 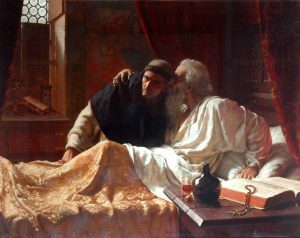 He exhibited in the Royal Academy for more than 40 years of his life. 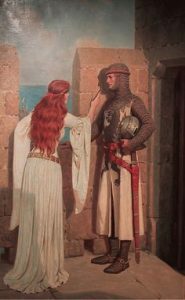 Many a time, during these over 40 years it was noticed that he changed his style, textures, use of color schemes from time to time. 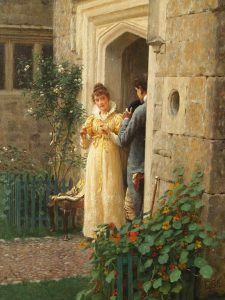 ‘The Secret’ by Edmund Blair Leighton in the year 1885. 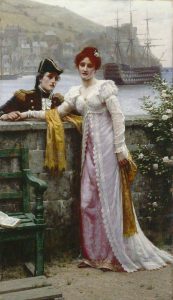 Edmund Blair Leighton married a woman in London known as Katherine Nash. 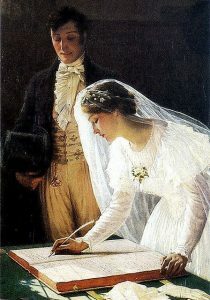 They had two children together – a boy and a girl. The son also went on to be a painter. Blair was also close to his family. 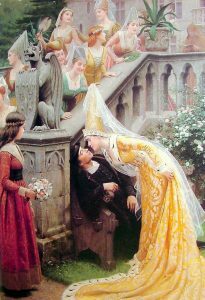 Edmund Blair Leighton died on the 1st of September 1922, in London. He was known for his dedicated craftsmanship, his highly polished and finished work.